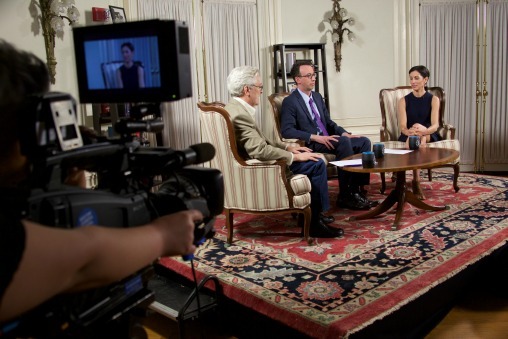 NEWPORT, R.I.—The Pell Center at Salve Regina University has announced its latest undertaking—a talk show that interviews today’s best storytellers about their creative process and how their stories impact public understanding and policy. 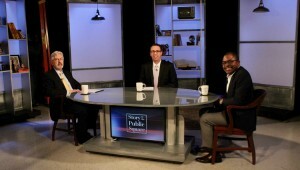 The show, “Story in the Public Square,” taped its first two episodes on June 5 and June 8, with Lisa Genova, best-selling author of Still Alice, and New York Times journalist Dan Barry, appearing as guests. “Story in the Public Square” is named after the Center’s initiative to study, tell and celebrate stories that matter. 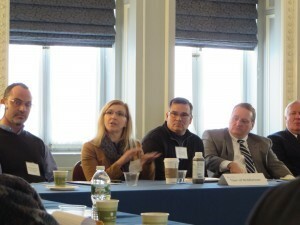 Initially presented as a conference, Pell Center Executive Director Jim Ludes and G. Wayne Miller, Director of Story in the Public Square and Providence Journal staff writer, saw an opportunity to expand the program’s reach. Ludes and Miller, who describe the concept as “Inside the Actor’s Studio” meets CNN, also serve as co-hosts for the talk show. Each brings a unique perspective and professional experience to the project. Miller—an accomplished storyteller in his own right—has published 14 books, as well as a number of series for The Providence Journal, including “Into the Heart: A Medical Odyssey,” a nine-part series on the invention of open-heart surgery and “The War on Terror: Coming Home,” an eight-part series about returning veterans of the post-9/11 wars in Afghanistan and Iraq. He also produced a documentary, “Coming Home,” which was nominated for Outstanding Documentary at the New England Emmy Awards. Ludes, in contrast, is the self-described “policy guy.” In nearly 20 years in Washington, D.C., Ludes immersed himself in national security issues, served as a national security advisor to then-Senator John Kerry, now Secretary of State, built a think-tank, and shepherded President-elect Obama’s four priority nominees for leadership of the Department of Defense through successful Senate confirmations. While the hosts come at the show from different perspectives, the conversation brings them together. Miller focuses on the guest’s storytelling craft, while Ludes explores the ways in which the guest’s work contributes to shaping public understanding of issues and, where appropriate, policy itself. Together, the two hosts hope to educate audiences not simply about any single issue a guest may talk about, but about the power of storytelling in American society today. 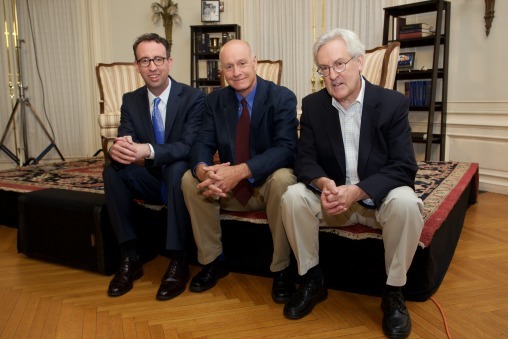 The first two guests, appearing before live audiences at the Pell Center in Newport, R.I., set the bar high. Lisa Genova, who also won the 2015 Pell Center Prize, was the first guest on Story in the Public Square. In a smart and provocative conversation, she shared how her personal narrative shaped her voice as an author and the impact of her work on communities hidden by neurological disease and conditions. Having earned a Ph.D. in neuroscience from Harvard University, Genova is uniquely qualified to bring these stories to life. In four best-sellers, she’s profiled people living with Alzheimer’s disease, autism, traumatic brain injury, and now Huntington’s disease, in her latest book, Inside the O’Briens. She sees herself as an advocate for people who heretofore have been lost in public discussions, set aside by society that is intimidated—if not scared—by diseases and conditions they don’t understand. 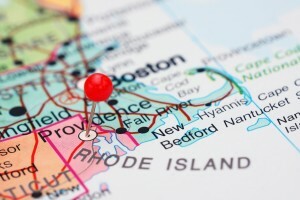 The show’s second guest, Dan Barry, elaborated on how his background living in a working-class community in Rhode Island helped shape his work as journalist. Barry, who was part of a Pulitzer-winning team at The Providence Journal, was also a finalist for two other Pulitzer prizes at the New York Times. In columns and series for the Times, Barry often employs a behind-the-scenes approach to reporting—heading in the opposite direction of the reporters covering big events. In his coverage of riots in Ferguson, Missouri, last year, for example, Barry profiled the people who work for the police department in that embattled city. Unlike Genova, Barry does not see himself as an advocate, but both writers spoke eloquently about the importance of empathy in their work.